1. 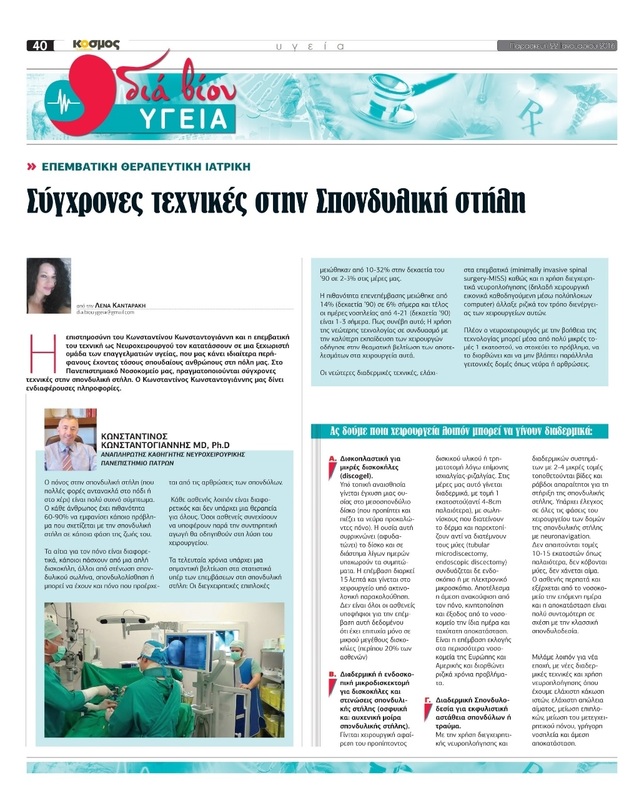 “Deep Brain Stimulation in secondary dystonia: current trends and a review of the literature.” Z. Kefalopoulou, C. Constantoyannis. In Dystonia: Causes, symptoms and treatment. Editor J. Kurstot, Nova Science Publishers Inc. 2009, ISBN 978-160876-445-7. 2. A Review Of The Current Status Of The Management In Disorders Of Consciousness” M. Georgiopoulos, C. Constantoyannis. In Functional Impairment: Management, Types and Challenges. Editor Emaad M. O. AbdelRahman. Nova Publishers Inc, 2012, ISBN: 978-1-62081-410-9. 3. “The impact of subthalamic stimulation on autonomic dysfunction in Parkinson’s disease” E.Trachani, E. Chroni, C. Constantoyannis. In Deep Brain Stimulation: New developments, procedures and applications. Editors A.G.Sloan, A.I.Montes Villarreal. Nova Publishers Inc, 2012, ISBN: 978-1-61942-599-6. 4. “Subthalamic stimulation on autonomic dysfunction in Parkinson’s disease” E.Trachani, E. Chroni, C. Constantoyannis. In Horizons In Neuroscience Research. Editors A. Costa, E. Villalba. Nova Publishers Inc, 2014, ISBN: 978-1-63321-543-6.